Do you know why podcast hosts ask their listeners to “subscribe to this show in Apple Podcasts, Google Podcasts, etc…”? Do the hosts even know why? Was there some meeting of the medium’s founders in which they carefully weighed competing verbs and decided, “Yes! Subscribe is just the word we need to make podcasting easy and intuitive”? There wasn’t any such meeting. In fact, “subscribe” in this context predates podcasting, and it’s only because those of us who worked in the medium in those early days didn’t fight hard enough to change it that you, the podcasters of 2019, are saddled with this terrible word today. We failed you, and I for one am sorry. “Subscribe” in this context is a vestige of a technology that pre-dated podcasting. It’s a word that, to any normal person, suggests a paid service, yet it has become the preeminent verb in our free, ad-supported ecosystem. How did we let that happen?! The “subscribe” we know and hate today comes from RSS, a kind of web feed still used to distribute podcasts to your listening app. RSS is basically just a list of periodic content that the publisher can update at any time. For a while, you could get free print articles from various newspapers, magazines and blog posts via RSS, and it was great in a pre-smartphone world. You “subscribed” to the feed — by pasting the URL into a special RSS reader or, later, a browser plug-in — and voila! Whenever a new story was posted it appeared automatically in your queue. RSS was around for years before it was modified to include MP3 files, which suddenly made podcasting possible. RSS for text never went mainstream, so the ill-chosen word “subscribe” didn’t really matter. But when podcasting adopted the RSS standard it also inherited that verb. In 2005, Apple launched its podcast service in iTunes. It was a landmark and overwhelmingly positive moment for the medium, but Apple’s decision to label its action button “Subscribe” enshrined the word in our minds and our metadata. It meant that people who had been shopping for paid music downloads in one part of iTunes could wander over to the new podcast section, see the word “subscribe,” and quite reasonably conclude these too were downloads that required you to fork over some hard-earned cash. Sure, some people began to figure out that it was a free subscription, but those people were already interested enough to look past the word’s obvious first connotation. For years, as the head of Slate’s podcast arm, I tried to fight this misunderstanding by asking our hosts to say “Subscribe for free in iTunes…”, but I think it had almost no impact. After all, most of the people who heard that were already regular podcast listeners. They already knew how much it cost. We will never know how many potential listeners have arrived at a podcasting app, seen the word “subscribe,” and departed again, uninterested in adding yet another monthly charge to their credit cards. I’ve long thought this was a non-trivial issue for a medium whose consumer usage has only been growing by only a few percentage points a year until very recently. 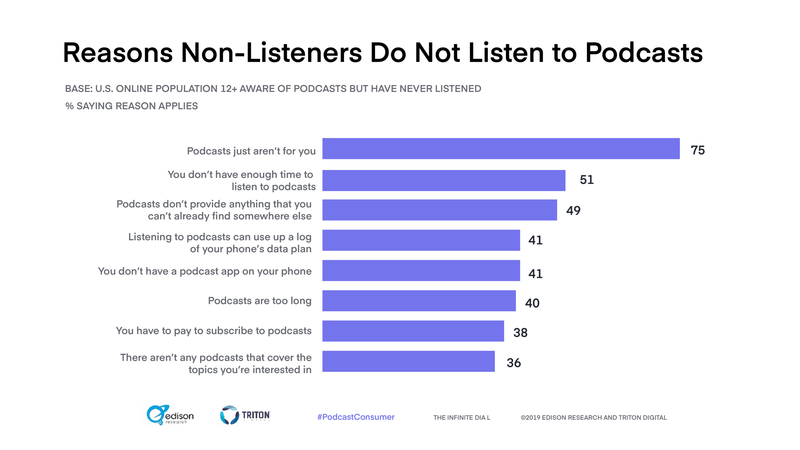 But now we have real evidence of the problem, thanks to the Podcast Consumer 2019 survey by Edison Research. Edison asked non-podcast listeners why they haven’t gotten on the bandwagon. 38%, more than a third, answered that it was because “You have to pay to subscribe to podcasts.” The word is right there in the question itself! Why wouldn’t you assume that? The problem with “subscribe,” while longstanding, is about to get worse. Actual paid podcast services like the high-profile Luminary (launching later this month), Stitcher Premium, and even to some extent Spotify are trying to get listeners to subscribe in the classic sense. I’m all for these experiments — good content is expensive and needs to be paid for — as long as we also maintain a robust free and ad-supported environment for the vast majority of people who prefer that method of supporting creators. But the more paid podcast subscriptions there are in the world, fighting for our monthly payments, the more important it is for the free part of the industry to change the damn verb. What word would I suggest? Given our comfort with social media terms, “Like” seems an obvious choice. Yet liking is something we tend to do once and move on. It doesn’t connote a longer relationship. Personally, I prefer “Follow,” which is what RadioPublic uses. It suggests an ongoing connection to a show without any hint of financial transaction. But I’m open to other suggestions. Got a better idea? Tweet it our way with the hashtag #scrapsubscribe. Posts by Megaphone team members. A blog publication by Megaphone. Follow us to keep up with podcast industry insights, best practices, and more.